It was never going to be an easy divorce, and now proceedings could drag on a lot longer than either side bargained for. At a crisis summit today, EU leaders will probably deny U.K. Prime Minister Theresa May the short Brexit extension she was seeking and instead force a delay of as long as a year. EU Council President Donald Tusk wants to avoid “creating new cliff-edge dates,” although he’s also proposing giving the U.K. the option of leaving earlier if it can find a way out of its domestic deadlock. The long delay certainly won’t be well received in London, where May’s party has little patience left with her leadership. Looking Bleak | It’s been five weeks since the European Central Bank announced fresh stimulus and the bloc’s economic outlook is only looking bleaker. The governing council will discuss policy today against the backdrop of renewed threats of American import tariffs and slashed IMF growth forecasts. Another likely agenda item: their new long-term lending program and the impact of negative interest rates. Black Hole | Brace yourselves for what could be the first-ever glimpse of a black hole today as part of an international collaboration to create a virtual Earth-sized telescope. The results will be announced simultaneously in six different places across the globe. A press conference hosted by the European Commission will be live streamed by the European Southern Observatory. Pension Probe | The EU’s lower court will rule today in a case involving Deutsche Post that dates back to 2011 and has spurred a series of legal challenges over Germany’s granting of state aid to the private postal service. In this particular case, Deutsche Post is challenging an eight-year-old decision by the European Commission to expand an ongoing probe to also assess the validity under EU rules of state financing of pensions for Deutsche Post employees. Elections Emoji | For those exchanging barbs on social media over next month’s European elections, there’s now an emoji to go along with your tweets. Starting today, the hashtags #EUElections2019 and #EP2019 will add an image of a ballot box including a navy blue ballot paper with a yellow tick mark, surrounded by the bloc’s ring of stars. Trade War | The EU is preparing retaliatory tariffs against the U.S. after Washington vowed to hit the bloc with duties over its support for Airbus. There’s a lot at stake if transatlantic trade tensions worsen. America had already threatened to slap duties on European car imports and the EU has struggled to build consensus to negotiate a cut in industrial tariffs to prevent that from happening. China Rapprochement | China agreed yesterday to address EU concerns over state subsidies to industrial firms, enabling the two sides to release a joint statement and present unity in the face of Trump’s “America First” challenge to the multilateral order. Italian Risks | Italy cut its economic growth forecast and raised the projected budget deficit, setting the stage for a fresh conflict between the populist government and Brussels. With growth lower than expected, the money Italy needs to meet its promised deficit target isn’t forthcoming. Nor is the government keen on measures limit spending. Worth a Thousand Words | If you wanted proof that climate change is sweeping through Europe, check out these satellite images. The changing conditions are thrusting farmers and power generators onto the front lines of a battle with nature that threatens to upend the lives of the half billion people who occupy the continent. 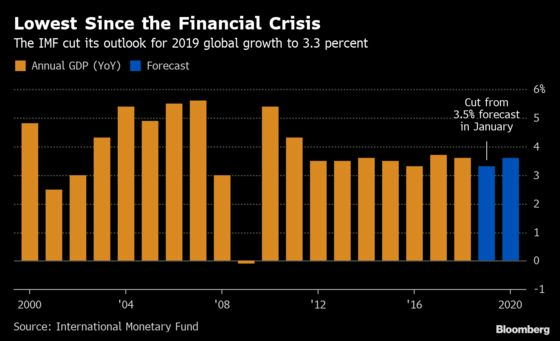 The International Monetary Fund cut its global growth outlook to the lowest since the financial crisis, projecting the world economy will expand 3.3 percent this year, down from a 3.5 percent estimate in January. Find out here what’s behind the third IMF downgrade in six months.